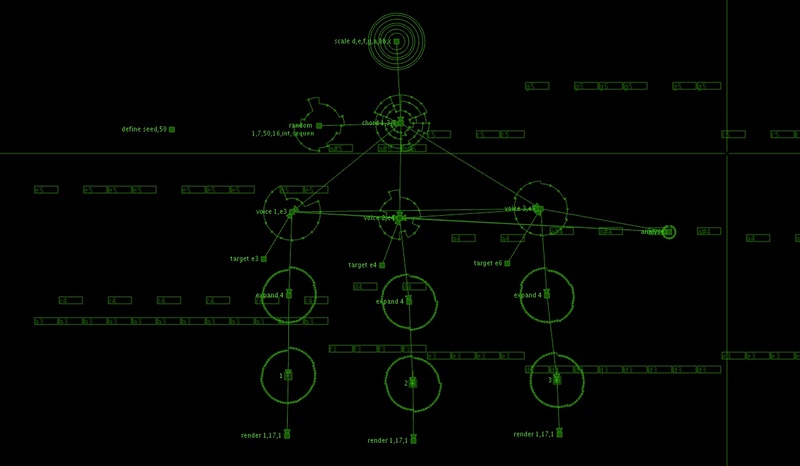 ‘Constellate’ is a generative/procedural MIDI composition application. The application is essentially a modular composition tool, which allows the creation of multiple interlinked nodes. Each node is assigned one of a number of predefined commands and parameters, which are then processed, with the data being passed on to other connected nodes. This data is then used to render MIDI data for playback and provide visual feedback. As changes are made to the commands and parameters, the MIDI data and visuals update. In addition, as the composition plays, the visuals update to indicate which notes are playing. – To generate new melodies, rhythms and song structures according to a user-created system. – To experiment with new structures, scales, rhythms, melodic contours and compositions within a given framework quickly and easily. – To generate harmonies and melodies which fit a given chord pattern or as an aid to further develop existing ideas. – As a visualisation and learning tool for music theory study and analysis. ‘Constellate’ is rare among generative music applications in that it updates and provides visual feedback of both current and upcoming events in near-realtime. In this context, it functions as a live-coding music application, enabling both improvised composition and live performance alongside from accompanying musicians. ‘Constellate’ has been created for performances by ‘theskyisthinaspaperhere’ and is not commercially available at present. Hopefully, in time the application will be ready for release, but in the meantime, please feel free to get in touch for more information or enquiries re: custom solutions or installations.